A powerful organic restroom cleaner that removes the toughest bowl stains, melts soap scum, removes hard water stains and cleans dirty tile & grout. This organic bowl and restroom cleaner is an ideal replacement for harsh acidic cleaners such as hydrochloric and phosphoric acid. 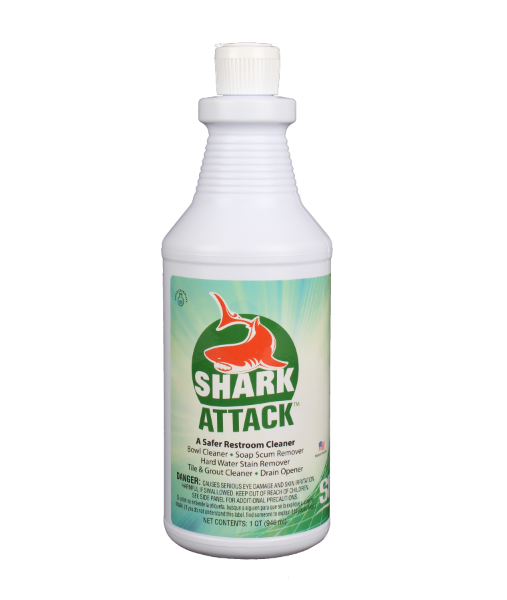 Shark Attack is formulated as a thick clinging formula that provides extended contact time for effective cleaning..
Phosphate-free and silicate-free. It will not upset eco-system of water and waste treatment facilities. It is non-fuming and does not contain any toxic chemicals. Designed to target soap scum, hard water stains, dirty tile & grout and bowl stains. Once the job is done, it's powerful action goes further to open the slow moving drains. Spray or apply on the surface to be cleaned. For heavily soiled surface, apply as-is without diluting. Allow product to sit for few minutes. Wipe with cloth, bowl swap or sponge. Rinse thoroughly with water. For metal surfaces, test first in an inconspicuous area. Wipe and rinse immediately.